Convenient and stylish, the Arona Tray by Aquanova is a designer bathroom accessory which makes it easy to keep the rest of your accessories organised and in one place. It brings contemporary and modern style to your bathroom as well as adding real functionality and helping keep your space organised. 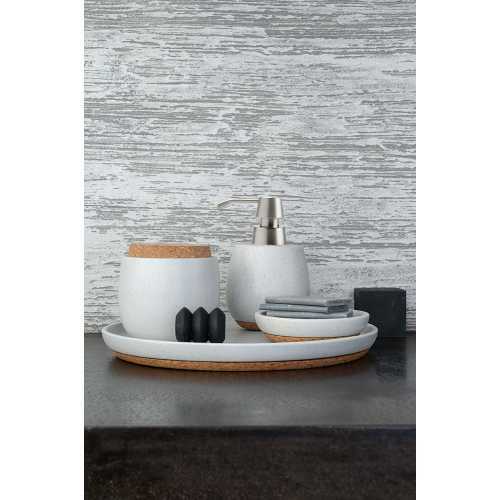 The Arona Tray by Aquanova is crafted from matte grey ceramic and it features a base made from warm, classic cork, an ideal and traditional material for the bathroom. It immediately gives your room a modern lift and this is especially the case when it is teamed with the other accessories in the Arona Collection. Even on its own the Arona Tray coordinates with ease and provides a handy place to store your toothbrush holder, tumbler, soap dish and many more bathroom essentials. Each Arona Tray measures 30cm in diameter and 3cm in height. It sits with ease on your bathroom counter and makes it easier to keep your tiles clean, with no toothpaste, soap or anything else leaking onto your surfaces, with the tray in place.